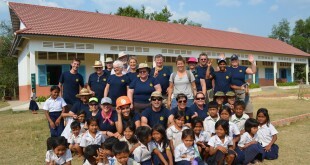 The Rotary Club of Gravenhurst has once again committed to supporting the Rotary Wheels for Learning (RWFL) Bicycle Distribution Program in Cambodia. The RWFL Bicycle Distribution Program is an international humanitarian project led by the Rotary Club of Gravenhurst, Ontario. In its seventh year, the project’s aim is to provide bicycles to disadvantaged rural children in Cambodia so they may have the opportunity to attend school. This year’s trip will see us complete eight bicycle distributions in six provinces of Cambodia; Takéo, Kampong Cham, Siem Reap, Battambang, Kampong Speu, and Kampot. With the help of generous donors like you, we plan on distributing 100 bicycles in each of our eight locations during the months of January-February 2018. At this point, we are actively looking for team members (both Rotarians and friends) with a strong sense of humour, ability to “go with the flow” and the willingness to immerse themselves into the local customs and culture. The “RWFL Team Cambodia 2018” will be led by a proven team of MaryAnne Marshall, Lee Johnson and Mike Cole – this will be their fourth trip to Cambodia and the third as team leaders. Dates: 26 January – 18 February 2018 (some flexibility in dates can be provided). Approximate Costs: $3300.00 Canadian (includes airfare, lodgings, meals, in country transport, spending). Team size: 17-19 members (Rotarians and Friends). RSVP: Interested members should send a response by mid-July 2017 to secure a place on the team.